The 25.6 metre sailing yacht My Song, offered for sale by Francesco Vitale at Nauta Yachts, has been sold to a direct client. Built in composite by Cookson to a design by Reichel-Pugh, she was delivered in 1999 as a high-performance racer/cruiser and refitted in 2012. Nauta Design gave her an uncompromising interior where the floors, structural bulkheads and even the sinks are in carbon fibre, lightened by a trim in Honduras mahogany. Accommodation is for six guests in three cabins including an immense master suite with a sofa that converts to another berth, a double cabin to starboard and a port twin, all with entertainment systems and en-suite shower facilities. A large saloon has two navy blue settees facing an entertainment centre including a 60-inch LCD television screen and there is dining available both here or in an al fresco setting in the cockpit. 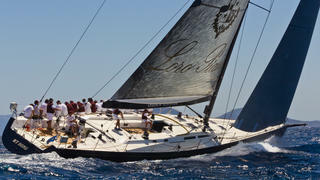 A familiar sight at Mediterranean regattas, including the popular Loro Piana Superyacht Regatta, she almost always achieves a podium position. Her decks are uncluttered, allowing guests and crew to move about comfortably and safely. Deck gear comprises no fewer than 10 Harken winches to control a fully battened 215 square metre mainsail and a 145 square metre genoa sail. In addition, she has a 14 ton total ballast torpedo bulb and fin. The ballast bulb is a lead casting with antimony, attached to a steel fin. Under power, a 250hp Cummins engine gives her a cruising speed of 10 knots. Lying in La Spezia, Italy, My Song was asking €2,750,000.